Posted on Tue, Feb 14, 2012 : 5:40 a.m.
As the Westminster Dog Show gets underway this week, and the focus turns to purebred dogs, the Humane Society of Huron Valley would like to remind prospective dog parents to keep in mind that about 25 to 30 percent of the dogs at our shelter are, in fact, purebreds. While we think mix breed dogs and shelter dogs are as worthy as any purebred, we do understand that some families will only look for a canine with papers. However, please do your homework and never buy a puppy or dog from a pet store or backyard breeder. We encourage you to check the shelters or breed rescues first, but by all means seek out a reputable breeder if you want to purchase a dog. Responsible breeders continuously study their pedigrees and breeding stock, do health checks on all of their dogs involved, properly raise and socialize their puppies and stand behind their puppies. 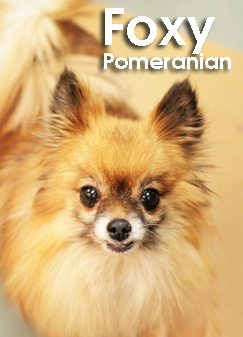 This week we feature one of our purebred dogs named Foxy. Foxy is a 13-year-old miniature Pomeranian. She was abandoned on the side of a busy road, crammed in a small plastic carrier with her best friend, a cat, who we named Caspian. She was found and rushed to us by a recent adopter who never imagined the crate actually had animals in it when she stopped to pick it up. Both were cold, terrified and very sick. Both were senior animals with serious medical conditions, likely never knowing the adoring life so many of us provide our beloved pets. Despite our very best efforts, poor Caspian didn't make it. And many others would have given up on Foxy in her frail and uncertain state. But we saw Foxy for who she truly is: a cheerful little dog with a gentle spirit and much love to give. We showered her with a whole lot of TLC, and in a short time, she overcame the odds. Everyone here loves her personality as she greets them and "asks" for attention. She is a very special dog who is now looking for a very special home. She is spunky, affectionate and very loving dog who would love to be your new Valentine!